We’ve just finished up the K-drama, Princess Prosecutor! It is really good – the amazing Park Shi Hoo from Queen of Reversals and Family of Honor, along with Dr. Champ‘s and IRIS‘ heroine Kim So Yun are in it. I watched it alone last year, and I loved it so much, I asked Bill to watch it again with me. :p He enjoyed it as well. So there is this one episode where his royal hotness, Park Shi Hoo, makes a big batch of Joomuk-bap for Kim So Yun, so she can go have a little picnic with her crush (it’s before she realizes that she likes Park Shi Hoo). When Park Shi Hoo was making joomuk-bap, I was determined to make myself and Bill some as well! Joomuk-bap is a picnic food for Koreans. When you’re going on a picnic with your friends or for a date, you make kim-bap (basically the Korean version of a sushi roll without the fish) or joomuk-bap. If you make joomuk-bap for your date, it is considered to be very sweet and romantic. 😉 And of course, it’s the same when Korean mothers send their kids on a field trip at school or a picnic with their friends. When literally translated, joomuk-bap means fist rice. 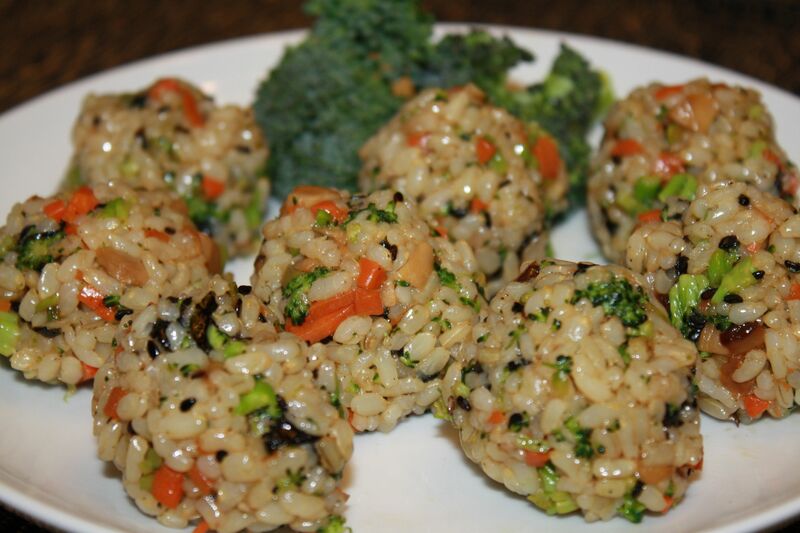 We call it joomuk-bap because we use our fists to make the fist shaped rice ball. It’s a very nutritious, colorful and yummy dish. And it has to be accompanied by miso soup – they are soooooo yummy together!!! So here you go, maybe you can make it for your loved ones when the weather turns a bit warmer for a picnic! 1. Dice the mushrooms, broccoli, carrot and other left over veggies (like perrilla leaves). 2. 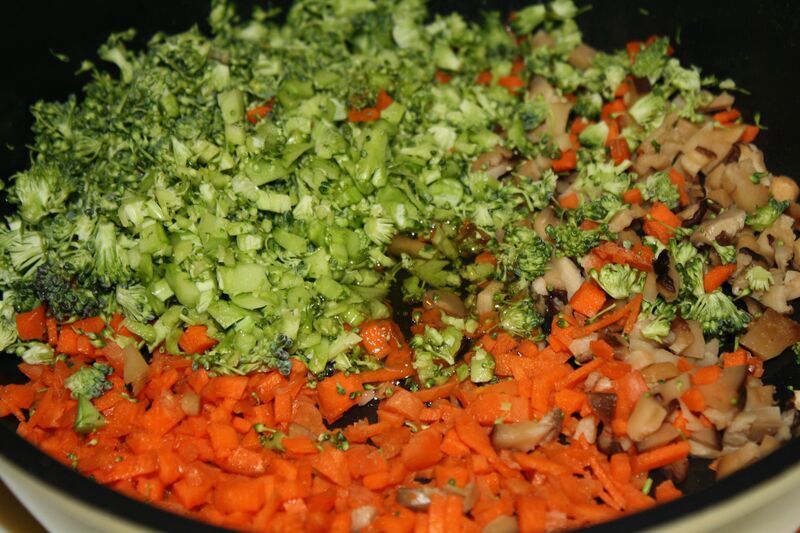 Start stir frying the diced veggies with flaxseed/vegetable oil. 3. Add soy sauce, salt and black pepper and stir until veggies are cooked. 4. In a larger bowl, add brown rice, some salt, lemon juice, and sugar and mix well with hand. 5. 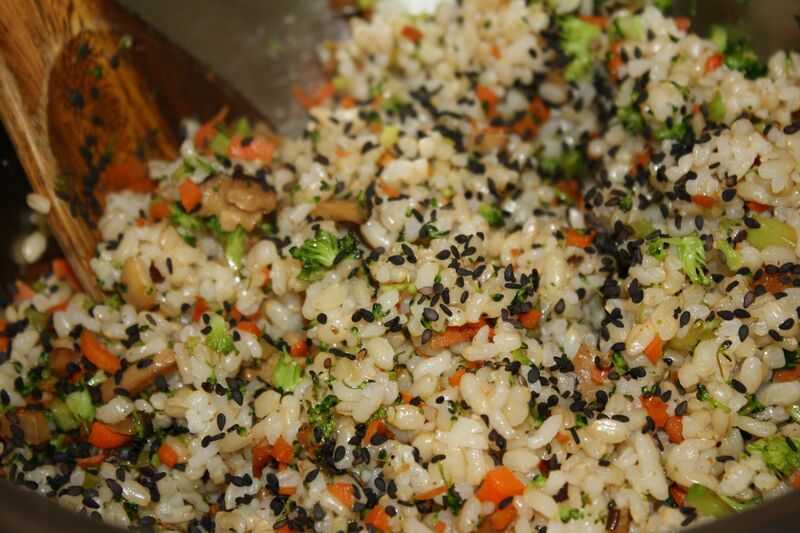 Add the stir fried veggies and black sesame seeds to the rice bowl and mix well. 6. Add the crumbled nori/kim with sesame oil and mix well. Taste and add salt if needed. 7. Shape into small rice balls/bites (I find it easier to make the rice ball shape with those disposable plastic gloves you get at Asian grocery stores for like a dollar, although I try my best not to use them. Such a waste and not good for the environment. If you can, try putting some sesame oil on your hand first and then try shaping them, that could work better than just using your hand without the oil, as the rice can stick). Dice the veggies and stir fry until cooked! 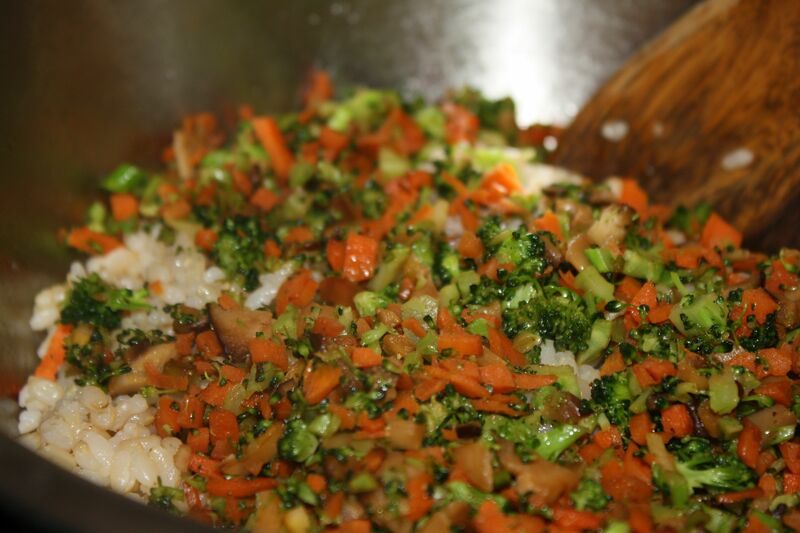 Add the stir fried veggies into the brown rice bowl. Mix all the ingredients well, and then add nori/kim crumbles and then mix again. 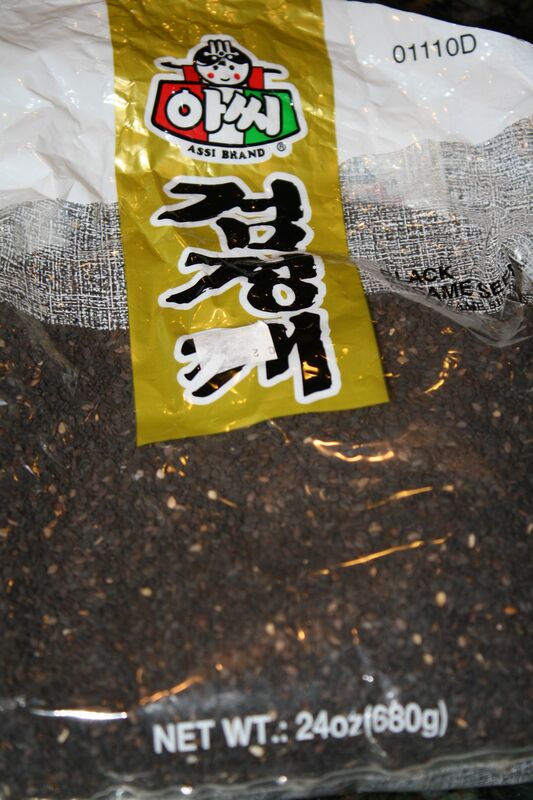 These are black sesame seeds! They are used for a fancy traditional porridge and all sorts of other dishes in Korea -considered even better quality than the yummy and nutritious regular sesame seeds. 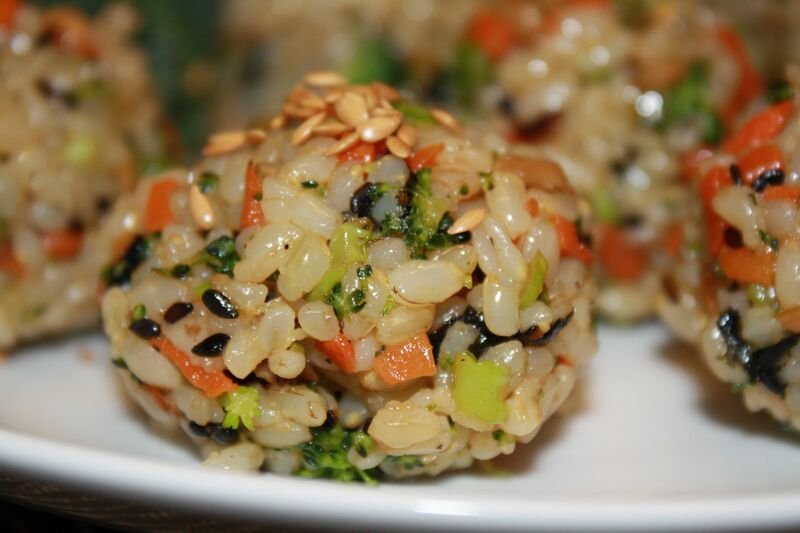 Sesame seeds have tons of calcium in them! 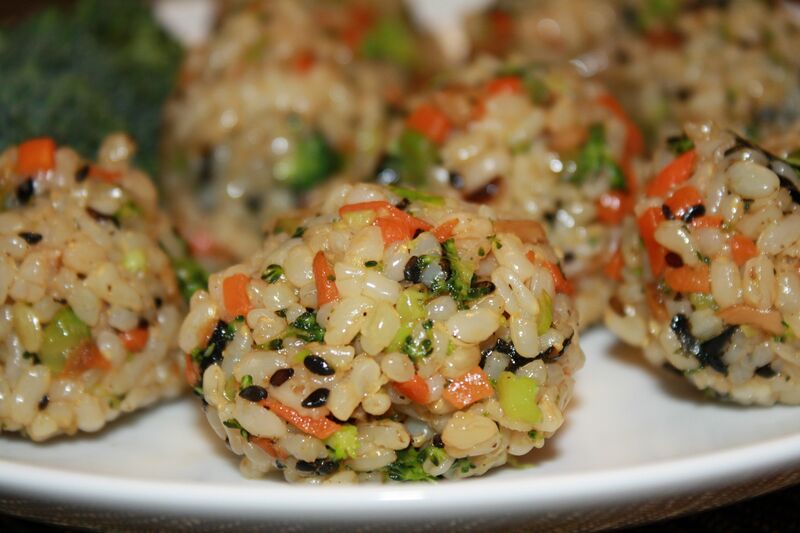 Shape them into little rice balls! Don’t forget to serve with Miso soup and some radish pickles! Thank you for this! I’ve never heard of joomuk bap before, and I’ve read a lot of Korean cookbooks. It looks delicious and fun. I’ll bet you could even use the vegetables uncooked, since they’re chopped so small. That would make it even healthier, although you might lose some flavor depending upon what you would have used to cook them. Hello, Lu! Thanks for finding us. It’s so wonderful to hear that you’re interested in Korean cooking. You’re right, Joomuk-bap is really a lot of fun. Leaving the veggies uncooked might be good as well, it would be a more refreshing flavor I think. It could be a bit harder to make them into ball shapes, as they might not stick as well. Hope you have a chance to try it sometime! Hi! I found you a couple of weeks ago and have really been enjoying your blog. Yes, I love Korean cooking, though it’s often hard when you’re vegan. A couple of friends and I are planning to have a vegan kimjang together this spring. 🙂 You make a good point about the rice balls holding together–I’ll have to try it and find out! Congrats on a very nice blog. park shi hoo is so handsome! i have been watching korean dramas for the past 10 yrs thanks to the english subtitles. i have stopped watching hindi dramas or movies becoz of super fine acting of the korean actors in the dramas. i am planning on trying Joomuk-bap soon. please add more recipes. I am right there with you about Park Shi hoo, Jayanti. 😉 We hope you enjoy the joomuk-bap recipe. It’s easy and yummy. Yes, I will make sure to keep adding more recipes. Thanks for finding us! (small correction) becoz i am addictated to the superfine acting of the korean actors. I am going to try making this just for dinner, have a picnic at my own kitchen table! 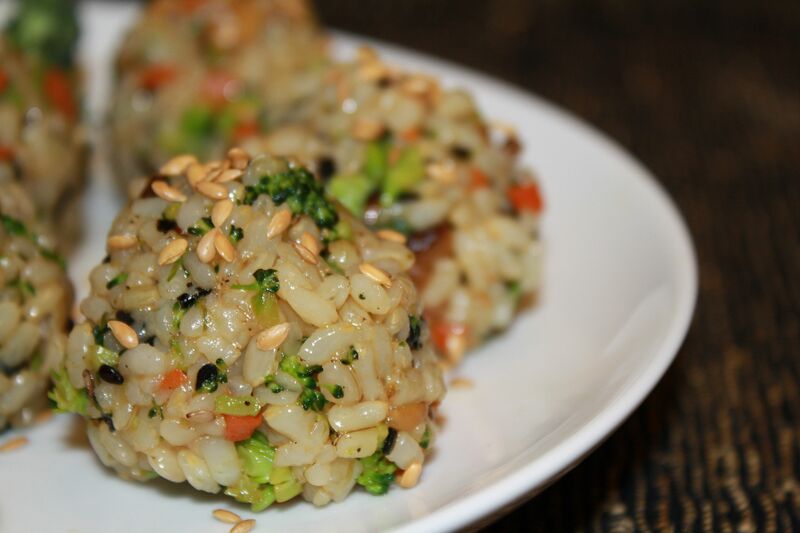 It looks really delicious and I love rice recipes! Yay, I’m so glad to hear that. 🙂 We love joomuk-bap, I hope you enjoy it too!! Okay! Made a batch the other day, my brother dropped by and I fed them to him! I’m so glad to hear that you tried it! Yes, at first they are quite hard to stick, so you need to play around with for a bit. I’m glad you stuck with it. 🙂 Joomuk-bap with cayenne pepper actually sounds good to me too – I do like things a little hot! The recipes in your blog are mouth watering! I love visiting your blog often for all the tasty recipes. I am Indian by birth but I have fallen in love with Korean culture, art & dramas. I love watching all programs & shows on KBS & MBC. I love everything about Korea so much that my family thinks maybe I was a Korean in my last birth!!! My aunt has recently started watching Korean dramas and she simply loves Joo Sang Wook who acted in “Thornbirds”. I like Han Hye Jin Shi, she is soooo pretty! I’m so excited about this recipe and your whole blog! I have everything in the fridge to make this, and it’s a perfect day to pack up a picnic dinner. Thanks for sharing! Trina! Thank you for visiting. We know your blog and have visited many times before! We particularly like your pictures. 🙂 We are so glad that you are packing up Joomuk-bap for a picnic dinner. I hope you enjoy it. We love it and make it often. Keep us posted and we will keep visiting your blog as well! I read your post on KoreaTaste and followed the link here. Thank you for sharing the idea for a quick picnic food and also for all other interesting articles. I’m interested in fining good restaurants in Korea and hope to get some information on your dining experience in Korea. Thanks and keep up the good work! Thanks for visiting our site, eatplayluv! We miss the restaurants in Korea now that we’re back in the US. Korean restaurants in the states are so expensive and limited in dish variety that we seldom are willing to go to them. There are so many good options in Seoul, though. Let us know if you have any specific questions about dining in Korea and we’ll be happy to share our thoughts! This food looks so delicious …. wish i could try it….i have tasted kim bap and kimchy in korean resturant but i haven’t tasted this one….hummm i really must try on nxt day……. Awesome! can’t wait to make a picnic for my hubby! I already have most of the ingredients in my kitchen too which is fantastic! Awesome! 😉 Hope you both enjoy it!! Hi Michele! Thanks for finding us! K dramas are fun – and vegan Korean food is even more fun!! 😉 Hope you enjoy the recipes and always let us know if you have any questions!